Granger Plastics Company, American custom rotational molding leader, is available for complete manufacturing services including rotomolding, design, mold making, manufacturing, assembly, order fulfillment and warehousing. The Granger ISS is the most durable, longest lasting, lowest maintenance storm shelter designed to easily and effectively protect your family from danger. Many safety features standard and includes lifetime warranty against cracking, leaking, rotting or material deterioration. See why the ISS is America’s leading tornado shelter. Rotationally molded Aerospace products stand up to the stresses of shipping while saving money by requiring dramatically less maintenance than traditional ULD containers. Superior durability provides the lowest total cost of ownership and unique design extends the life of the unit. See how Granger is revolutionizing this industry! Air Cargo Container offerings of LD 2's, LD 3's and LD 8's. ForeverSafe theft deterrent cemetery products add extra assurance that your loved ones memorial will be safe from desecration. Available in a variety of colors and styles including rotationally molded cemetery flower vases, replacement vases, staked vases, vase/canister sets and water tight urns from durable polyethylene construction. Keep their memory safe, with ForeverSafe. Granger Plastics Company offers a number of material handling solutions for a wide variety of applications. Rotationally molded polyethylene provides extreme durability and long lifespan. Some products include laundry or recycling carts, Intermediate Bulk Containers, storage containers and full service custom rotational molding for specialized designs. Granger Plastics Company has a 20 year rotational molding legacy including groundbreaking design capabilities, innovative mold making and superior manufacturing quality. 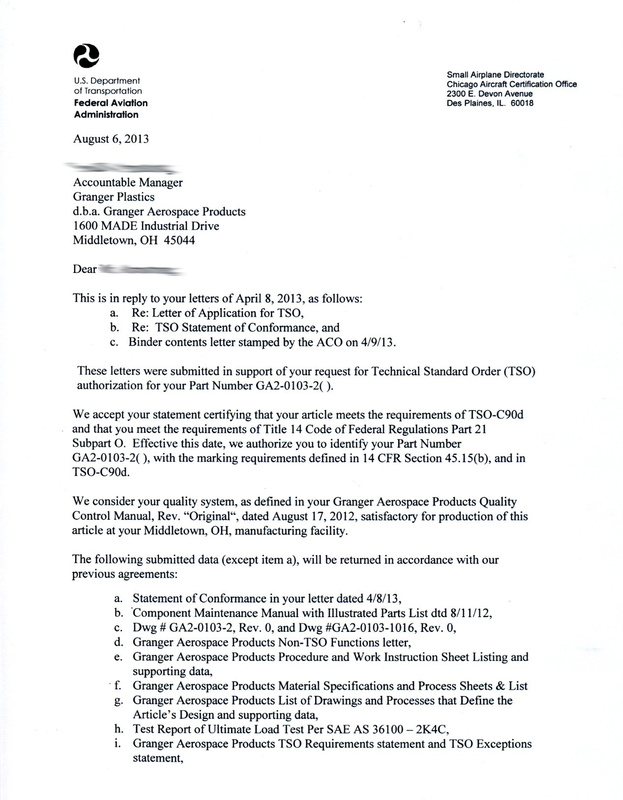 Simply put, in the world of rotational molding Granger has set a new standard of excellence. Full custom rotational molder able to manufacture the most difficult of parts or successfully produce the simplest designs, Granger Plastics Company delivers the highest standards will all parts, large or small. Do you wonder if your family will be safe in a tornado? The Granger ISS is the solution to your peace of mind. The Granger ISS rotationally molded tornado shelter lasts longer than any other material on the market thanks to the exceptionally durable Polyethylene construction. With a double wall foam filled design, the Granger ISS offers protection in areas where others fail. With nearly 20 years of tornado shelter experience, Granger continues to lead the underground shelter industry! Granger has provided custom Air Cargo Containers for nearly 20 years to a number of industry leaders. Recently, Granger Aerospace has developed a line of cost saving ULD Containers that offer huge savings in the total cost of ownership due to polyethylene construction offering extraordinary durability, ease of maintenance and lighter tare weights. Granger Aerospace Products are available in standard colors as well as can be special ordered in unlimited hues. Granger Plastics Company is an internationally recognized rotational molding company specializing in superior design and manufacturing. Granger has produced custom products for a wide variety of industries including aerospace, medical, agricultural, material handling and many more. With full manufacturing capabilities, Granger is a rotational molder able to carry an idea from inception through design, manufacturing and order fulfillment. Rotational molding is one of many plastic processes which includes the utilization of a mold and using it to mold resins into a part or product via heat transfer. It produces extremely durable parts with a very long lifespan and can be used for small to large quantities. Many materials can be roto-molded and polyethylene is by far the most commonly used material. Design is essential to successful part production. Granger Plastics Company is an authority in rotational molding and can help you determine if this process is the right one to produce your part. Continue thru the Granger Plastics website to learn why Granger Plastics continues to be the leading internationally recognized Rotational Molding Supplier! Many products manufactured by rotational molding have a multi-step process, often including trim work, assembly, foam filling, packaging and more. Below you can watch a video of the Granger ISS In-ground tornado shelter being manufactured, outlining the process of rotational molding. See material being loaded into the mold, parts being cooked in the oven and then removed from the mold, as well assembly and finishing stages. Learn detailed information and specifics about the rotomolding process and what it requires! Click the image below to watch the rotational molding process video as Alli explains the intricacies and nuances of rotational molding! Granger Plastics is well versed in providing a wide range of high quality, custom rotationally molded solutions to a wide variety of industries! Being one of the only independently owned rotational molders in the world with a concentration on custom rotational molding, allows Granger to maintain a detailed focus on its custom rotomolding clients. 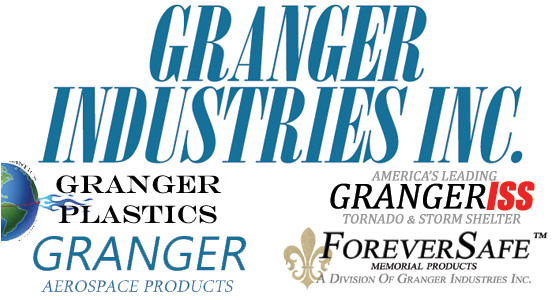 With expectation exceeding solutions to customers extending from some of the largest names in Aerospace, Agriculture, Defense and more, Granger continues to grow in international recognition and accolades. Click the link below to watch the video to learn more details about what is typically required to get your custom rotomolding project into full scale production with one of the world's best! Granger Plastics Company has a long tradition of excellence spanning 20 years offering full service custom rotational molding design and manufacturing. Founded by one of the legendary names of rotational molding and under the design and leadership of Jim Cravens since 2002, Granger is capable of taking an idea through development and into production seamlessly and efficiently. Specializing in solution based design work and large, complex part experts, Granger is capable of any size of production. Learn more about Grangers Rotomolding operations here. Providing safety and peace of mind to families across America the Granger ISS is the longest lasting, lowest maintenance, easiest way to protect your family from weather and other emergencies. Innovative design allows for many benefits including no anchoring, no leaking and no reason worry about high water tables or tight installations. The Granger ISS Tornado Shelter is leading the way to a safer tomorrow through accessible protection. Saving money on the cost of air freight is not easy. The rotationally molded ULD Containers by Granger Aerospace provide huge savings in cost of ownership due to their one piece polyethylene body which offers extraordinary durability and ease of repair. 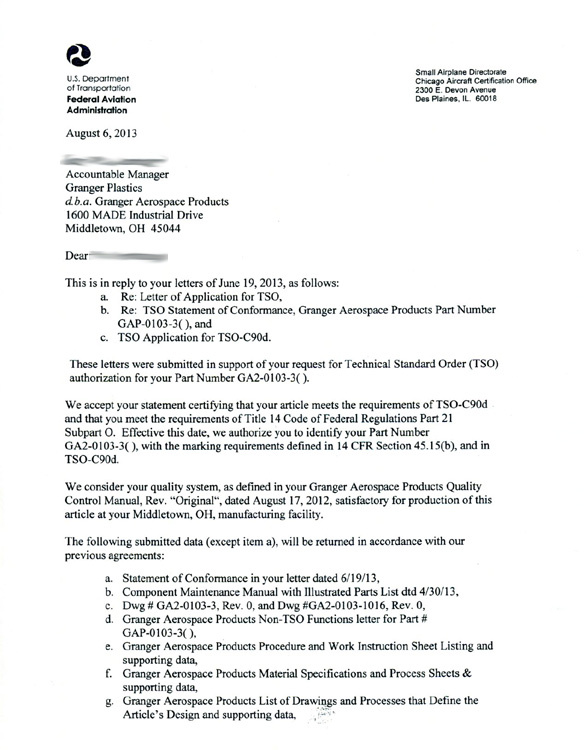 Granger Aerospace Products received TSO authorization in 2013 and brought its revolutionary line of ULDs to market including LD 2, LD 3 and LD 8 containers. The containers are all staples in the air cargo and commercial airline industries. The polyethylene construction of the Granger ULD offers a longer lifespan and significantly lower maintenance costs. This reduces overall operating costs and time lost for repairs. Changing from the current materials of fiberglass, aluminum or sometimes polycarbonate may also offer savings in other areas. The lighter weight and more durable design also saves in fuel burn over some current air cargo containers. Granger Aerospace Products ULD Containers are available in standard colors as well as can be special ordered in unlimited hues for easy identification and branding. All available Air Cargo Containerss are offered in a flat bottom design as well as with forklift pockets and have a number of customizable features. Custom rotational molding and design services are available for specialty cargo containers. Many businesses in this industry are urgently looking for changes that will use resources most economically. Granger Aerospace has the knowledge and experience to offer many cost saving solutions. ForeverSafe Products is a theft deterrent alternative to expensive metal created for those who have been affected by theft in a cemetery or are protecting the memorial of a loved one from that possibility. Beautifully rotationally molded polyethylene is given the look of bronze or granite to blend with other materials in the cemetery. While much lighter than metal or stone when picked up, to the passing eye ForeverSafe Products blend seamlessly. Extremely durable permanent, replacement, or temporary cemetery flower vases and a full line of urns are available. Granger Plastics Company has a 20 year legacy in designing and manufacturing the highest quality rotationally molded parts available. Any of the products manufactured by Granger is held to the highest standards of excellence which is the very foundation of this company. “Solutions Beyond Expectations” is the motto of the cutting edge work Granger Plastics Company, Granger Aerospace Products. ForeverSafe Products and the Granger ISS is dedicated to in all pursuits. Granger Plastics is constantly innovating and developing its products and is recognized around the world for both custom manufacturing capabilities as well as its proprietary items. With decades of experience in all aspects of rotational molding design, mold fabrication, manufacturing and order fulfillment Granger Plastics Company is your one stop for all roto-molding needs. Full service facilities offer engineering staff for design work, metals shop with mold making and repair abilities, all housed in one of the most capable manufacturing facilities in America. Accepting work of all sizes, in all stages and with any technical challenge, anyone who is considering rotationally molding a product can gain insight by contacting Granger Plastics Company for a quote. For more information about any of our product lines or for information regarding custom rotational molding services please contact 866-510-9701 or 513-424-1955.